Yesterday i got a package in the mail. I wondered who it could be from. It was from mommy gen of Wonderful Things in Life, i got one of the special prizes she was giving away from her last contest the Spread the Love Giveaway. 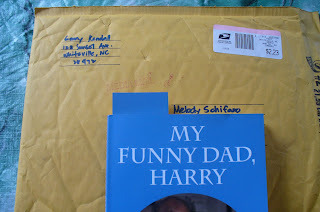 I have been to this author's blog and i love reading about her dad Harry. I actually started reading it last night, it seemed interesting and heartwarming. To mommy gen thank you for my special prize, i honestly love it. After reading this book ill go to the authors blog and say my piece on what i think about her book. I wish we can recieved package everyday, its fun and nice right? got the package from genny yesterday too. nice prize,congrats lodz! Congrats on getting the book from her. I look forward to your review. Glad you are happy with your prize and I hope you enjoy reading it as much as I enjoyed writing it. I look forward to hearing your thoughts about it. Heheeh thanks also Lodz for joining. Glad you like it and I know Karen will like your review. I would love to hear your thoughts about the book.